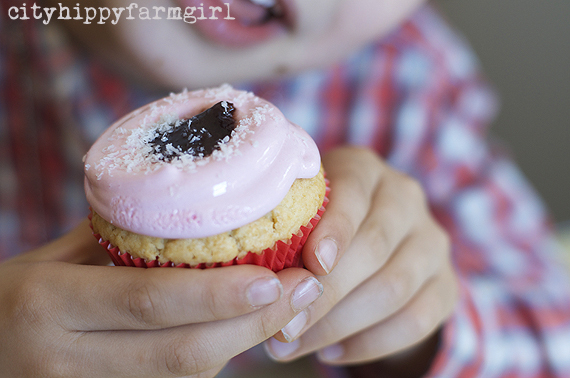 This entry was posted in Food Glorious Food and tagged australian, cupcakes, iced vovo, iced vovo cupcakes, simple by cityhippyfarmgirl. Bookmark the permalink. What does Vovo mean? The cupcakes are lovely and with marshmallow icing and jam they must be delicious. I wouldn’t mind having one of those with a nice cuppa! Sorry Heidi, I should have put up a link for the non Australians. The humble Iced Vovo is a biscuit http://en.wikipedia.org/wiki/Iced_VoVo A very plain non exciting biscuit as an adult but as I kid, oh how I loved them! I wonder how you would melt the marshmallows without a microwave? I think, a little bowl over a saucepan of steaming water Sara should do the trick. You want to just warm them enough to soften their shape. And hurrah for ‘real food’ in canteens I say. And very easy to reshape, is the humble marshmallow. That is awesome! No wonder there were squeals of delight! These are awesome Brydie! I must confess I have never really liked iced vovos – chocolate cherry crowns were my Grandma’s weakness and I still need any marshmallow-y offering to be smothered in chocolate. ( I don’t think we ever got over them being withdrawn from the production line). Have you tried making your own marshmallow? It is fun, and easy, but we discovered they tend to slide off the stick if you try to toast them in the fire! I haven’t made my own marshmallow, my mum used to when we were kids, but I’m yet to step up for that….Just thinking of your roasted homemade marshmallows. Roasted in banana leaves 🙂 and a sizeable spoon to scoop out the warm gooey goodness. It’s the texture that I love when they are roasted, plain, yep I can take or leave, but roasted that’s completely different! A wise woman’s words Sam. Before I even seen what these were called I knew I would love them & then I seen the name & smiled- one if my favourite bicuits in cupcake form! Yuuuuum! Now I just need an occasion to make them…. Reannon I was waiting for an occasion too…turns out it being a Saturday was good enough. These look great! What a treat- and they’re so nice to look at, too, which is always an added bonus. I bet the sounds of delight were heard right down the street! What a great remake of the classic biscuit – and really beautifully done too. To be honest Margot…neither have my kids 🙂 An iced Vovo for them is now a cupcake. Mmm, they look delicious, I love the clever idea of marshmallows on top, brilliant. They really are so much better than the biscuit aren’t they! 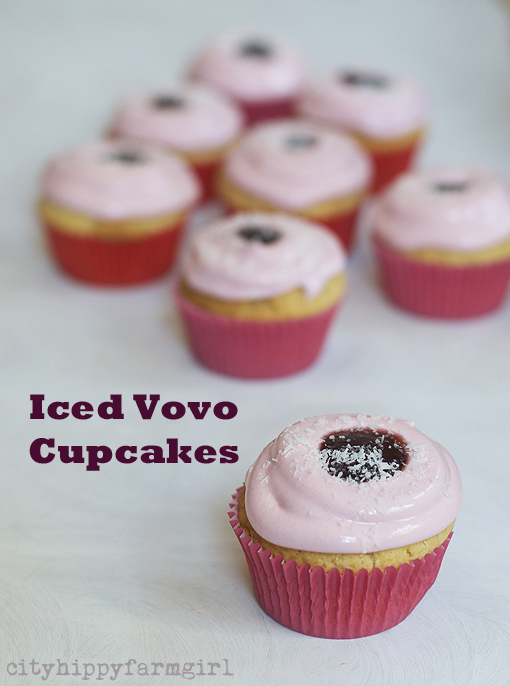 I thought long and hard for months beforehand on how I was going to pull it altogether so I’m thrilled you made them and liked them Lorraine 🙂 Hurray for iced vovo cupcakes! 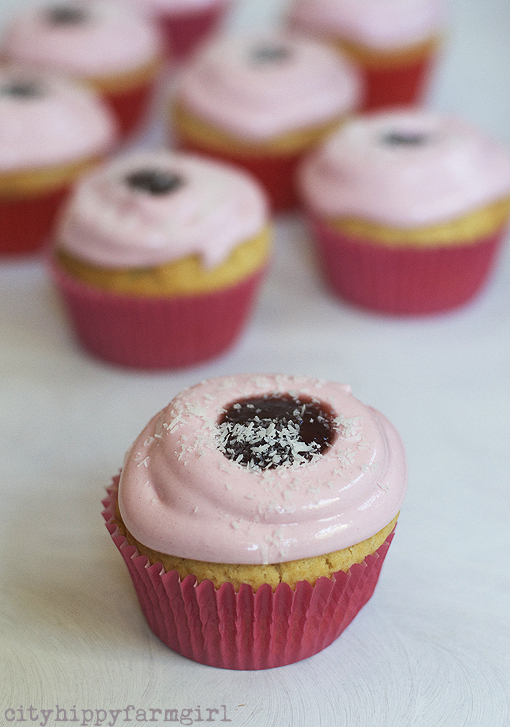 I.need.these.in.my.life – I am bonkers for iced vovos so may just have to make these.